The crystal clear 7” LCD Monitor is a perfect addition to any driver that needs assistance backing up. See the whole world behind you in rich colors. It is also an LCD monitor so it is very light as well as thin. In addition, it has two video inputs so you can connect a camera and a game system or DVD player. This monitor is compatible with all our cameras and any car; it connects to any power source or a cigarette lighter. It can mount on your windshield or dashboard (mount included). Super easy installation. By using the “CUSTOMIZE AND UPGRADE” section at the top right of the page, you can choose which style of backup camera fits your needs and budget. This system comes preconfigured with 2 cameras however, we have different styles for all kinds of uses. Change 1, both or none of the cameras in this system, the choice is yours. Please use this guide to help you select which camera is best for you. The RV Box camera Has a 170° Degree viewable angle, its waterproof and has auto night vision. Has optimal reception for up to 70ft this allows it to work perfectly without interruption in any vehicle. The camera is one of the most durable we have, with incredible adjustability and night vision clarity. The RV Box camera has a metal sun shield visor to protect you from glare and pebbles. This is by far our toughest built camera. It has been regularly used in cars, vans, buses and even industrial sized caterpillar trucks, operated in the harsh oil sand of Canada. This camera can take a direct hit from a rock and it will still work like new. It has also been very popular with RVs, because its housing allows you to install the cameras on multiple sides of your RV. This camera is also a wireless camera so there is no need to run cables through your Car or RV. We also have a C Clamp to clamp down the camera instead of bolting it, you can also use our battery packs and then its truly wireless and movable. TadiBrothers only sells one type of wireless camera because its the ONLY one on the market that is reliable. 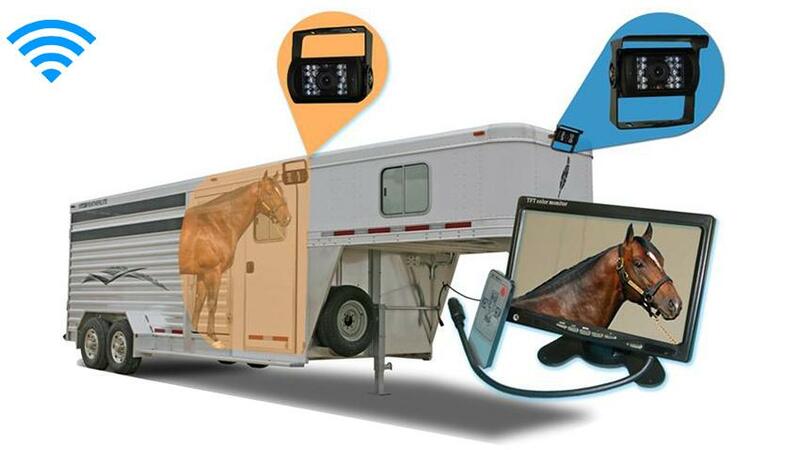 You can also mount this camera INSIDE your horse trailer and see your horse while driving down the road! You can see the inside of your trailer and watch your horse and its environment while driving. You can use the other camera for either your hitch or as a camera. If you use it as a camera you can also use it to change lanes safely. This wireless camera has a 70ft range that can go through any vehicle. Also, This system, like most of our vehicular products that have an LCD screen, can be used for video gaming, Considering that a perk or bonus for purchasing our back up system (others block that feature). Airstream aluminum trailer with consistent clear picture. "I love the u-bracket, smart design fits in my housing perfectly and it was very easy to angle it to fit my needs. I can’t vouch for the 70ft range they claim but my airstream is 30ft so the reception was obviously perfect. Install relatively painless a few question in where everything goes but 2phone calls to their service department put me back on track. 14 days on the road and so far I’m very happy"
"I used this to view my horses at night, I upgraded the lens to wider view and opted for the CCD enhanced night vision option. I also got a 2nd camera without upgrade just to put in the outside of the trailer to watch while I’m driving but I didn’t do any upgrades to that. A few month ago the camera would have come in handy when one of my horses were in distress, haven’t had any issues since but the peice of mind I get is worth every penny. I’m sure one day something will happen but at least now I have a camera there to see what’s going on. " "Purchased side camera system, worked as advertised out of the box. Replaced the rear view mirror in my windowless van. Realized I didn't need a wireless system. Called, got the hard wiring, returned wireless components and got a prompt refund to my credit card. Couldn't ask for better customer service support. " "Loved it, it was just what you said it was , good doing buissness with you thank"